I’m afraid I’m a little disappointed that my previous comments weren’t taken on board and despite mentioning it in the comments of a previous thread occupational therapy (which I remember seeing on the list doesn’t appear to be represented here), neither is physiotherapy, operating department practice, nutrition or paramedic science. In fact the Heath and Social Care thread seems very narrow (only covering the professions of Nursing and Midwifery) considering the breadth of disciplines in the school. I am subscribed to the blog but am not aware of consultation on this through other forums. Many thanks for your comment. This is exactly the kind of response required. I have added your suggestions (occupational therapy, physiotherapy, operating department practice, nutrition and paramedic science) to V4 of the list which will be circulated via the Blog at the end of this stage of the consultation (after 19 August). Also – if you could add Occupational Science that would be great. This wasn’t yet on the Library of Congress website but I did send it to them as a suggestion. I would also like to see the Internet and Web 2.0 included. I would put them under an Information or Information Science heading, but there isn’t one at the moment. Thanks for your comments. I will add clinical psychology into V4 of the keywords list. Thanks for your suggestions. I have added all of them to V4 of the list, with the exception of ‘Interprofessional Education’ which is already included under the ‘Health and Social Care’ heading. I’ve added ‘Internet’ and ‘Web 2.0’ in the ‘Computer science and informatics’ group. I looked at the ontology and I would like to say that I am very happy to find complex systems in there. However, it was placed in Computer Science and Informatics. I believe it is not so easy with this area of research to categorise it in one place. Area of complex systems is a very interdisciplinary field as it is present in Computer Science, Biology, Sociology, Economics, Mathematics, Physics and many more. And my concern is that the current ontology does not really support this kind of interdisciplinary approach. Do you have any plans for promoting interdisciplinary approach in the ontology? The ontology in its current form is a tree not an overlapping set of concepts. More complex ontology would enable different disciplines to overlap and gather them under the umbrella of interdisciplinary concept (e.g. complex systems). Thanks, Kate. I agree that the structure we currently have for the ontology is too rigid and not flexible enough to meet the requirements of inter/multidisciplinary research. 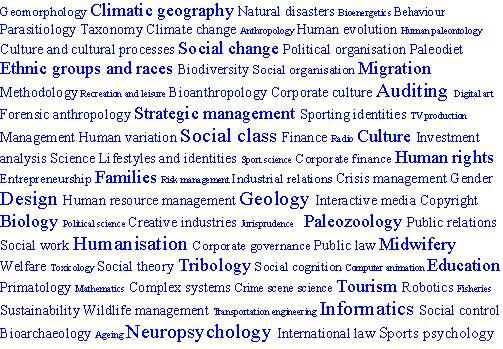 How about it there was just one list of keywords which were not grouped into smaller subject clusters? Or do you need the disciplines to map to one another? 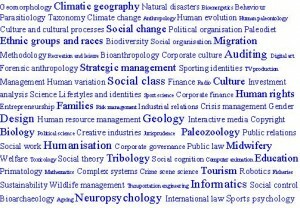 In terms of interdisciplinary research it would be good if in the ontology you can gather the already idetified research fields (that belong to a specific research field) also under the crosdisciplinary area. To be more specific and present you my idea I am preparing the figure that will show it. I will send it to you later on today. Thanks for adding my suggestions, just one problem. Putting ‘Internet’ and ‘Web 2.0′ in the ‘Computer science and informatics’ group could suggest the technical side of the discipline rather than the information aspects which I think should be under an information heading. Could we also add the following terms to the Media and Communication list? Would it also be possible to add methodological terms, so as to help accentuate research dimension (e.g., content analysis, discourse, ethnography)? My original comment does not show up, so have emailed you separately. Thanks so much for these additional keywords, Einar. I have added them to version 4 of the ontology which I plan to circulate via the blog later today.